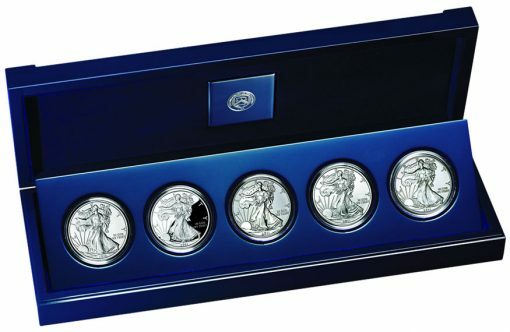 The American Silver Eagle 25th Anniversary Set is now available from the United States Mint for $299.95, plus the standard shipping and handling fee of $4.95. The anniversary set, as expected, went on sale at Noon Eastern Time on Thursday, October 27, 2011. This special release celebrates 25 years of the American Silver Eagle coin (read about this year’s coins). The United States Mint has been striking the one ounce .999 fine silver coins every year since 1986 in the bullion version and all but one year, 2009, in the numismatic proof version. The collector uncirculated strike has only been around a few times in the last five years. Ever since the set was first announced in August, there has been a buzz about them. Demand is expected to be fierce, with likely delays in the early going for ordering online and through the phone. Proposed prices in the secondary market are already sky-high based on anticipated collector interest. Orders for the 2011 American Silver Eagle Anniversary Set may be placed on the United States Mint website (http://catalog.usmint.gov), or its toll free number 1-800-USA-MINT (872-6468). 100,000 units will be sold, and there is an initial limit of 5 per household. The first three listed above have been available individually this year, as described in more detail later in this article. The last two, however, are unique and can only be acquired from the Mint in this 25th Anniversary Set — at least that is the expectations, thus making the set extra special to collectors. Tens of thousands of them will sell for that reason alone. The bullion, proof and uncirculated coins (shown above) are three of the five coins that will be packaged within the American Silver Eagle Anniversary Set which is priced at $299.95. Investors and collector demand has skyrocketed in recent years for Silver Eagles, another indication that the anniversary set will be a top seller in the Mint’s line-up. The United States Mint has been selling the 2011 Bullion American Silver Eagle coins to its network of Authorized Purchasers in bulk orders since January 3, 2011. As of Wednesday, October 26, 2011, an impressive 36,375,500 bullion strikes have sold. The coin’s smashed the annual record earlier this month. The bullion version is the only investment grade coin in the set. It has a brilliant finish and no mint mark. The two United States Mint facilities producing these are West Point and San Francisco. Since the bureau does not sell bullion coins to anyone except their Authorized Purchasers, this anniversary set is the only means for the public to buy the bullion version directly from the Mint. When the 2011-W Proof American Silver Eagle coins hit the scene this summer, they sold like hotcakes. A cool $22 million was made in six days after 367,623 of them were ordered. The most recent sales figures showed 783,787 sold as of Monday, October 24, 2011. In 2006, the United States Mint began making the Uncirculated American Silver Eagle coin. It was sold as a stand-alone product and also part of a 3-coin 20th Anniversary Silver Eagle Set. Then in 2007 and 2008, the Mint kept it available for individual sales but had to stop its production in 2009 and 2010 in order to keep up with demand for the bullion counterparts. On September 15, 2011, the Mint started selling the 2011-W Uncirculated American Silver Eagle. Year-to-date sales were at 195,507 in the most recent report. A 2011-S Uncirculated American Silver Eagle is also in the new set. The only thing differentiating it from the other uncirculated issue in the set is the mint mark. The "S" denotes the coin’s origin in San Francisco, while the "W" indicates its origin in West Point. Also, as stated earlier, expectations are that this 2011 uncirculated San Francisco strike can only be purchased through the 25th Anniversary Set. The final, and the other expected unique coin in the set, is the 2011-P Reverse Proof American Silver Eagle. The last time the United States Mint made a reverse proof Silver Eagle was 2006 when it was part of the 3-coin 20th Anniversary Silver Eagle Set. A "reverse proof" means the background is frosted and the raised design and inscriptions are brilliant and mirror-like. Although the mint marks and or finishes vary from coin to coin, the designs are all the same. On the obverse is Adolph A. Weinman’s full-length figure of Liberty in stride. Her right hand is extended and branches of laurel and oak are in her left hand. The reverse was designed by John Mercanti and features the heraldic eagle with shield. It is carrying an olive branch in the right talon and arrows in the left talon. Learn more about the Mint’s American Eagle coin program at http://www.usmint.gov/mint_programs/?action=american_eagles. It took 33 minutes, after getting knocked off with, “Explorer cannot connect” at least 30 times, and I was already logged in for 45 minutes up to 1159, then the web site went haywire. But, I persisted and managed, 3 sets, that I will never open, to preserve their pedigree. There has to be a better way to get the anniversary label, without never seeing the coins until you fork over another 2-3 hundred dollars in “certification fees. Oh well, I did get three. Must have been a lot of coin dealers with their employees ordering the max of five sets. I’m sure we’ll see them offered tonight on the coin shows tonight. Was going to use the mint web site but all I got was the first page. Used the phone took half hour exactly done by 12:35pm. I’m totally unable to connect. The 800 number welcomes me, then gives me a busy signal. The online form keeps timing out and failing. All I want is one. For me. I haven’t anticipated a release this much since the Lincoln Coin and Chronicles set in 2009. 3 hours and still unable to order. This is rediculous. coins have been in my cart for over 2 hours, but I can’t check out. I have seen your comment before, but I am wondering why you are posting your complaint here on this forum to be heard only by casual collectors? If people buy it, they must not feel like they are getting ripped off. Are you unhappy because they have priced the product for more than you want to pay or more than you think they should sell it for? Businesses often seek the highest profit on a product they sell, pricing it accordingly. Please take your complaint to the Mint and we shall happily support you! I finally got through and ordered the (5) Sets. I’ve been offered $60 over each set already, for a profit of $300 for all (5) Sets. No telling what a Full Set of High Graded DPL 70’s will go for. Anyone have any guesses??? Also had On-Line problems and constant busy signal on the phone. Made it to the checkout online and then the system locked up for over 3 hours. Now we will see who made it in on time! IF 100,000 sets are available and each takes 5 as little as 20,000 collectors / dealers will get the set first hand! This will be the 2nd lowest mintage for 2 of the coins in this set. The 10th ann set ASE in MS 69 has sold for over $5k. Look out secondary market! Get one quickly…. These will be in very high demand!! Tried a bit late, at 12:40 pm. Made dozens of phone calls, while trying online as well. Finally at 3:40 pm was able to buy the limit of 5. On items like this I would normally place 5 separate single orders to keep some in sealed boxes but I figured I may never get this far on the order page again, so I bought all in one order. However, I won’t say I own them until they actually arrive. Finally after 4 hours I got in. If anyone is complaining about the price, check out what they are selling for on Ebay already. Mint price is going to turn out to be really cheap. They will probably sell out today. If you don’t like what the mint is doing, don’t buy from them. That will speak loudest if enough people do it. Mint web site says waiting list only, all sold out in under 4 1/2 hours, now that is impressive! This is the most frustrating thing I have ever encountered! I have purchased many HOT items from the Mint ($20 UHR, etc) but nothing like this…I cannot even get logged on now. @ the other Brian: I did complain to the Mint. They said they would not refund the difference. I have a subscription, they intentionally screwed all subscibers on this. They price of Silver is a bit higher now than it was when they priced them at $60 and cheated the subscribers. Is that ‘hog’ or ‘hoge’? Hogs would be coin dealers that paid employees to each order 5 sets and turn them over to dealer. Collectors that ordered 5 sets are just doing what the US Mint allowed. Ordering 1 set could be called being a hog in view of the fact that there are 300 million + people in the US and only 100,000 sets. No one forced anybody to make a purchase. And if you wanted to purchase 1 or 5, you knew it was going to be tough to get through. Or if a hog, should I say ‘trough’? I have purchased Silver eagles from the US mint since 1986 and have a subscription. It is interesting that the sellers on ebay have the 5 coin sets in hand when the small collector cannot even get one sent at the issue price. I would like to say I wont purchase from the mint but I am a collector at heart.